CHAIN FREE! A unique and charming arts and crafts style country cottage by the sea, built in 1928 and extensively restored by the current owners. Attractive wood and brick fa鏰de with top of the range hardwood framed argon filled double glazed tinted windows with leaded glass. 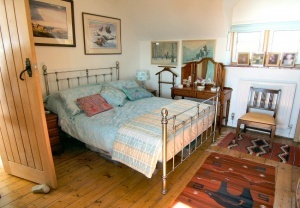 Oak floors and doors and a bright warm interior, south facing with lovely sea views. The garden to the front has two large wooden decks, one of which cleverly utilises the two garage roofs below. To the rear, the garden terraces up through a series of level areas of lawns and planting with a substantial wooden summerhouse at the very top with stunning views. The surrounding area is famed for its mild micro-climate which boasts the island抯 Botanic Garden and a variety of Mediterranean flora and fauna thrive here. 慣he Beatles� they got it so right, 憭A country cottage on the Isle of Wight拻. 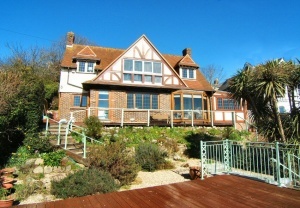 This is it, a unique land charming Arts and Crafts style country cottage by the sea. 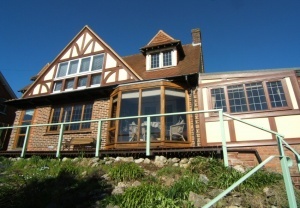 One of a kind, designed and built by a notable local architect for his own use in 1928, where he resided for decades in Ventnor the 憭Jewel in the Crown拻 of the Isle of Wight. Now sympathetically and extensively restored by the current owners. The gardens are a feature of the property. To the front is a dry Mediterranean Beach garden for low maintenance. Garden beds with shrubs and herbs amongst the palm trees. Trailing Rosemary off the stone walls with Mexican Choisya, Orange Blossom positioned to give wonderful aromas when the sun is strong. 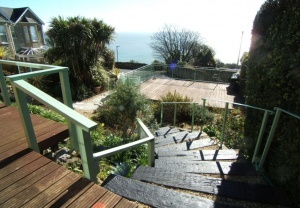 The Beach is topped by full width rockery leading to a balcony deck to the whole front of the house. The rear garden is extensively planted with maturing ornamental trees and aromatic shrubs, several magnolias and a small orchard of fruit trees with Azalea, Russian Olives, Silver Birch and Tuscany Pines. Here is a young fig tree of about five years which should bear fruit from 2018. 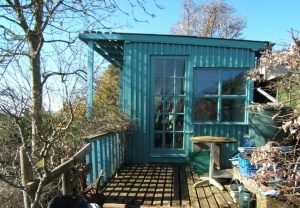 On the top level there is a Bosun Cabin, fruit trees and raised beds for salad and vegetables. 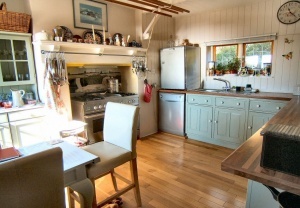 This is a versatile and adaptable home and would equally function for a young family, a mature or retiring couple, a family with older children or a two generation family with elderly grandparents etc. The ground floor bedroom with en-suite can be accessed separately from the rear entrance and could be regarded as an annex. Ex Pats, this home could be ideal as the home can be available on a 憭Turn Key拻 basis (as is common in the U.S.A) where the buyer purchases virtually the whole of the contents and this can move in immediately and conveniently (seller can give assistance and introductions etc. if requested). 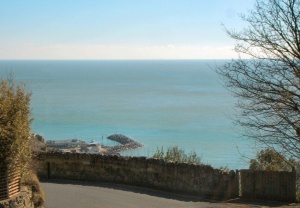 Also there is a small tidal harbour in Ventnor which is visible from the deck. OPEN-PLAN LIVING-DINING ROOM: 18�x 17�br />Double doors and window to front and two sets of windows to rear. 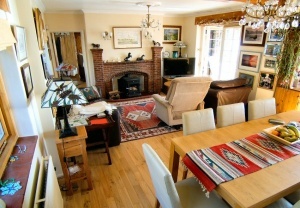 Oak flooring, brick fireplace with multi-fuel stove, wood panelled wall, central ceiling beam. Radiator. Plenty of space for dining table and chairs. Door to bedroom one and stairs to first floor. 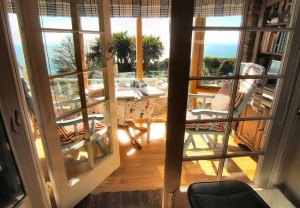 CONSERVATORY-LOGGIA 10�x 6�br />A real sun-trap with full height bay window to the south facing sea views across the front deck. Space for table and chairs. tiles. Space and gas for large range type cooker. Stainless steel sink and drainer with mixer tap. Space and plumbing for dishwasher, space and power for fridge and freezer. 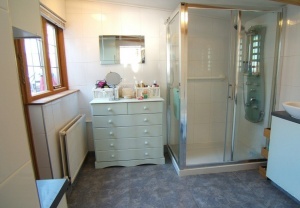 EN-SUITE SHOWER ROOM: 8�x 8�br />With window and glazed door to conservatory. Tiled walls and floor. Very large oversized sports shower with sliding glass door, vanity unit with contemporary wash hand basin mounted on top. Low level w.c. Radiator. REAR CONSERVATORY-PORCH: 11�x 8�br />Pitched double glazed glass roof, vinyl flooring. Windows on three sides and glazed back door to rear garden. Space and plumbing for washing machine, fitted kitchen units. 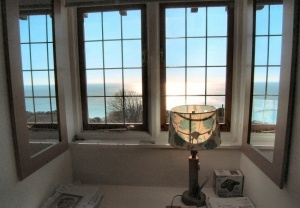 With very large south facing window and excellent sea views to front. 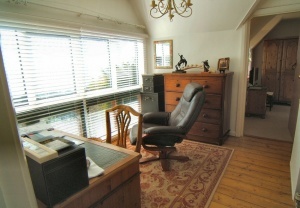 Exposed wooden floorboards, space for desk and seating and offering a variety of possible uses; library, upstairs living space. 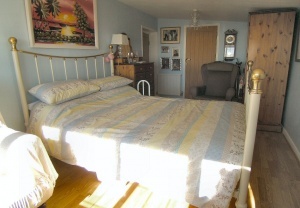 BEDROOM TWO: 17�x 9�br />Another double bedroom with lovely sea views to the front and further window with garden views to the rear. Attractive bedroom sized fireplace. Radiator. 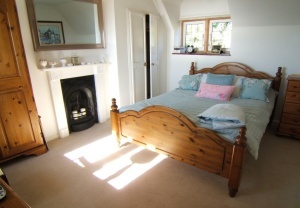 BEDROOM THREE: 12�x 9�br />Another double bedroom with lovely sea views to the front and further window with garden views to the rear. Attractive bedroom sized fireplace. Radiator. Cupboard. Window to rear. Exposed wooden floorboards and mosaic tiled walls. 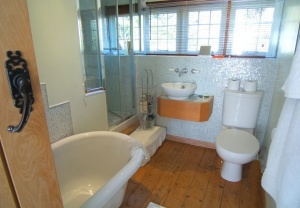 White suite with roll top bath with telephone style shower attachment. Low level w.c., wood fronted plinth with top mounted wash hand basin and mixer tap with concealed fixings. Step up to shower unit with folding glass door and further glazed side panel. Chrome ladder style heated towel rail. There are extensive areas of garden around the house. The rear garden reaches all the way up to Ocean View Road at the top and has a series of terraced areas of lawns and borders as well as a wooden summerhouse and further shed. To the front of the property there are two wooden decks; one extends across the full width of the front of the house and the second sits atop the two garages. Both decks enjoy lovely sea views. The garages measure approx. 20ft wide and 16ft deep. TO VIEW:�br />Strictly by appointment only through the vendors sole agents 01 Estate Agents.